Get your b.liv samples from any SaSa Malaysia outlets. 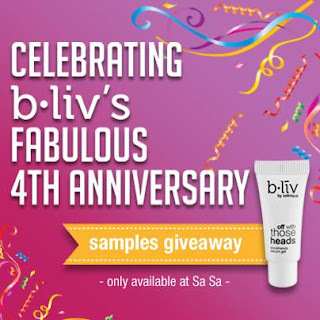 This giveaway of b.liv’s “Free Off With Those Heads Sebum Gel” is in conjunction with the company’s fourth anniversary. Sample giveaway is while stocks last only! This entry was posted in Samples and tagged bliv, SaSa, SaSa Malaysia on September 4, 2013 by Cyberpartygal.